Newly remodeled condo with private deck and view of table rock lake. 2 BR, 2 BA + 1 queen pull-out sofa, sleeps 6. Minutes from Silver Dollar City. Located at Eagle's Nest Resort, about 1/4 mile from Silver Dollar City and just minutes from the Branson Strip. This NON-SMOKING 925 condo is large enough to accommodate 6 people, with 2 bedrooms (1 King / 1 Queen), 2 bathrooms (master, plus second bath with dual access to hall and second bedroom) and a living area with a queen size pull-out sleeper sofa. Your stay will be relaxing and comfortable with all the amenities of home, including: 3 TVs, full size washer and dryer, well-equipped kitchen (stove, fridge, microwave, coffee pot, toaster), and the convenient touches that make a difference (coffee, microwave popcorn, hair dryers, etc.). A large, partially-covered deck (with table and chairs for 6 overlooks the Ozark Mountains and Table Rock Lake. The resort offers an outdoor pool, tennis and basketball court and play area. Local activities: Table Rock Lake, Silver Dollar City, Branson shows, IMAX, 2 outlet malls, boating, fishing. This complex has three floors, with two units per floor. Our Home is Your Home . . . : This unit are more than a financial investment for us; we bought as an investment in family-time. We have two adult children who are married with families of their own. After a few whole-family vacations, we decided Branson was an ideal place for a family vacation home. We look forward to providing the backdrop for your own family's memories. Location! Location! Location! 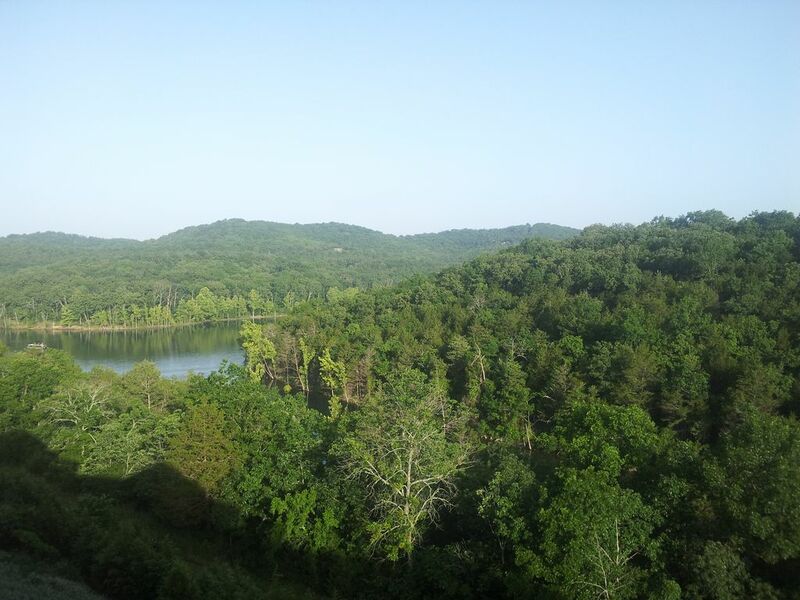 : Eagle's Nest Resort is ideally located next to Silver Dollar City and overlooking Table Rock Lake. The complex is family-friendly with something to suit nearly everyone. This was the first condo that we purchased. We live in Kansas and have always enjoyed taking long weekend getaways to Branson as a couple. We also like to get away with our two adult children and their spouses and families. When we decided to buy a vacation condo in Branson, we wanted something that was off the busy strip, but still convenient. We also thought a lake view would be nice perk. We bought this condo on the top floor (third) of a six unit building. Several months later, the condo next door (same building) went up for sale, and we couldn't say no to having the whole top floor of the building available for gathering with our kids and grand-kids. Great Indian Point location -- away from the crowds, but convenient to everything -- closest condo community to Silver Dollar City (just 1/4 mile), deck views of Table Rock Lake, quick drive to the marina. Great view of Table Rock Lake from the deck. The unit is located on the upper level of a 6 unit condo (2 condos per floor). Parking is on the 2nd level, so there is one flight of stairs to get to this unit. We enjoyed the condo very much! We enjoyed our stay in the condo. Marc was very easy to work with. We would recommend it to others. It was very nice. The condo was clean with everything you need to have a great time. Close to Silver Dollar City. Very quiet & relaxing. Thanks for staying with us and for the great review! Keep us in mind for your next Branson visit.